With that in mind, I thought I was ready for Braineater Jones, and, boy was I wrong. Everything Stephen said about Braineater Jones was true, but the book was far more interesting than a whodunit caper. Conventional zombie books have towns being destroyed and people running far and fast from the brainless monsters roaming the streets. Not this time. 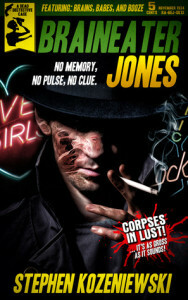 The undead have plenty of brain function left, and Braineater Jones has become their own personal private investigator. The uniqueness of the book comes in the voice. Stephen writes with an authentic feel of the 1930s with Prohibition having been recently repealed – except in the small town that the zombies inhabit. For some reason, booze keeps the zombies functional. Yet, Jones’s death is only a blip on what is going on. There are far bigger things going on that Jones is trying to get a beat on. His attempts to regain his memories from before his death have failed, and he has to rely on his best friend, a bodiless zombie head to navigate him through this undead world. It’s more of a P.I. book and less zombie apocalypse, as Jones discovers something bigger and badder than who put a bullet in him. The supernatural elements allow Stephen to take the story in places that a conventional P.I. thriller wouldn’t be able to go. 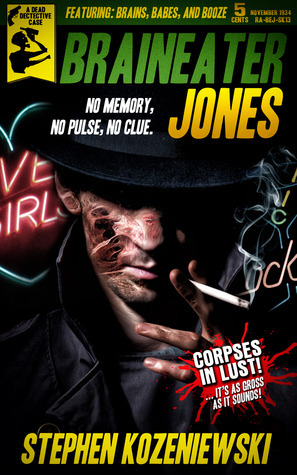 Braineater Jones was enjoyable and amusing with several moments bringing about chuckles. If you’re looking for something unexpected, Stephen’s book is definitely worth a try.